After a scrapped attempt several years ago to build an Aldi in North Winton Village, all indications are now looking good for a new store coming to the area, says Mary Coffey, a long-time neighborhood leader. Aldi will occupy half of the former Tops market, a 44,000 square-foot building located at the corner of North Winton and Blossom Roads. That Tops was one of five in the Rochester area that closed last year. The city Zoning Board is holding a public hearing at 11:30 a.m. Thursday, February 21, at City Hall where the board is expected to vote on the plan. Aldi needs variances for signage that is slightly larger than what’s allowed. 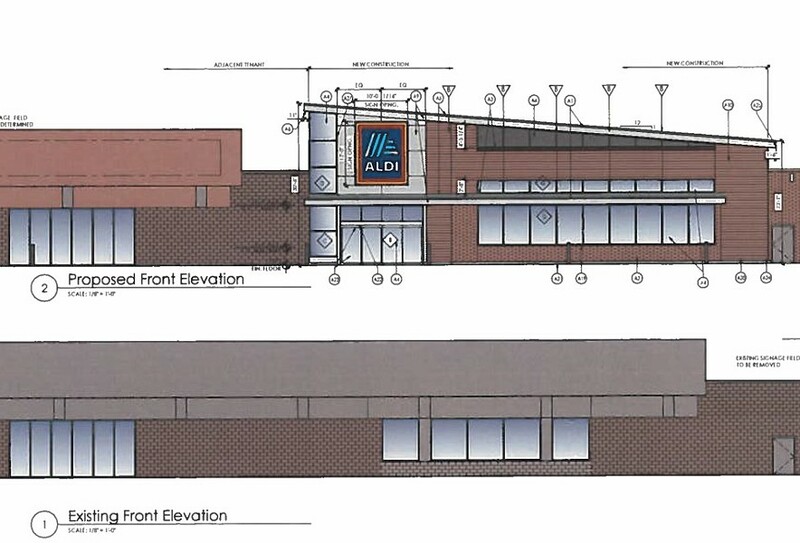 While Coffey and other neighborhood leaders pushed for a more vintage-looking storefront, the plans call for a modern-looking mix of masonry and metal facade with an angular roof line. Flaum Management, the commercial real estate firm that owns the property, has committed to updating the landscape and lighting in the plaza, says Loren Flaum. Reception to the discount grocery chain has been completely different than it was their first time Aldi attempted to move into the North Winton neighborhood. It was initially interested in the site of the old Jim’s Restaurant on North Winton. Jim’s was demolished in anticipation of a new building for Aldi, but the parcel was small, and Aldi would have needed numerous variances. Residents were fiercely divided on the idea. Some were angry that a chain store would be replacing Jim’s, a long-time neighborhood breakfast and lunch haunt. And many residents weren’t convinced that another grocery store was needed, since Tops, Wegmans, and Price Rite were already in the vicinity. But the former Jim’s restaurant site remains vacant, and nobody wants to see the Tops plaza sitting vacant, too, Coffey says. There’s been interest in the other half of the Tops building, says Flaum, but the company is still looking for a tenant.